The measure, which could be voted on next week, would also eliminate the diversity lottery and include $25 billion for border security. WASHINGTON — The compromise House GOP immigration bill will include a provision that children will not be separated from their parents at the border. Rep. Jeff Denham, R-Calif., one of the moderate Republicans involved in negotiations over the legislation, said the provision will be part of the yet-to-be-written text of the measure. A senior GOP aide confirmed the provision to NBC and said Speaker Paul Ryan, R-Wis., briefed House Republicans last week that it would be included in any bill that's considered. In addition to protecting the 1.8 million Dreamers who were brought to the U.S. illegally as children, the compromise bill would also eliminate the diversity lottery and include $25 billion for border security, Denham told reporters Wednesday. He said leadership is committed to completing the text of the bill this week. Denham is a member of the group of moderate Republicans who sought to force floor votes on immigration measures. Late Tuesday, moderates reached a deal with conservatives to allow two votes on the House floor next week — one on a compromise immigration bill and one on a conservative bill sponsored by House Judiciary Committee Chairman Bob Goodlatte, R-Va. The House will vote next week on the compromise legislation, along with the conservative immigration bill, as part of the deal worked out Tuesday between moderates and conservatives. As of now, only a general outline of the compromise bill has been completed. Ryan said Wednesday that the White House is on board with the Hill GOP's decision hold immigration votes next week. 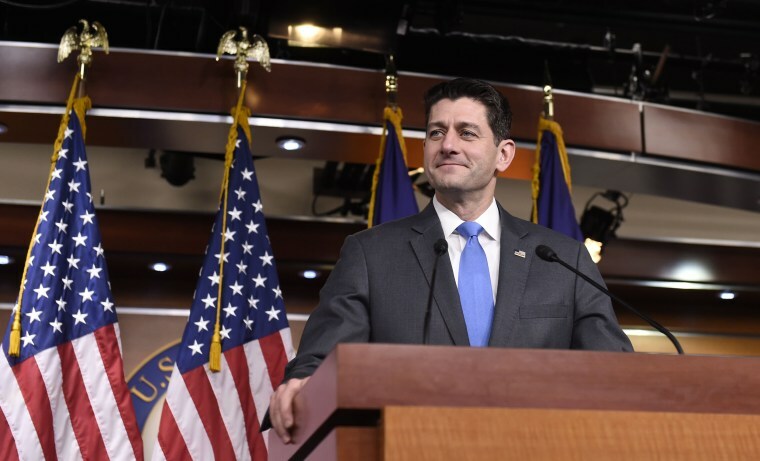 "I said before, the last thing I want to do is bring a bill out of here that I know the president won’t support," Ryan said at a weekly leadership press conference. "Well, we have been working hand in glove with the administration on this to make sure we are bringing a bill that represents the president’s four pillars so that we can come together." The speaker told House Republicans on Wednesday morning that he had spoken to President Donald Trump about the plan, and that the president was excited about it, according a person inside the House GOP conference meeting. "It will protect all Dreamers — those that signed up for DACA, those that did not but were eligible, as well as those that have been aged in," Denham told reporters Wednesday, after House Republicans met behind closed doors at the Capitol Hill Club. Ryan said members have agreed to the process that would lead to votes on the two bills next week, but that many of them would "reserve judgment" on the compromise bill until the final text emerged. The legislation would provide "certainty for every Dreamer that's out there," said Rep. Carlos Curbelo, R-Calif., one of the sponsors of the "discharge petition" effort to bring bills to a floor vote. While Curbelo and Denham said that the compromise bill would reflect Trump"s four pillars on immigration — border security, addressing DACA, scrapping the diversity visa lottery and ending family-based migration — both declined to offer additional details beyond the general idea that it would address the Dreamers. "Our goal has been to have a permanent fix for Dreamers given the certainty that they need, address the 1.8 million Dreamers that are out there today and then also give them a pathway forward so they're not only here, protecting them, but allowing them to work and go to school and signing up for military as well," said Denham. Both lawmakers said they are not abandoning the discharge petition, which requires 218 signatures in order to trigger floor votes on a wider range of immigration proposals. On Tuesday night, the moderates fell two signatures short of the threshold, which prevents them from holding a vote this month. If the compromise plan fails next week, moderates could still return to the petition and potentially hold votes next month. "It's important for people to remain committed to it, because it's there if we need it. And we may need it," said Curbelo. Rep. Chris Collins, R-N.Y., an ardent Trump supporter who had signed the discharge petition out of frustration about a lack of action on immigration, said the plan is to include "85 percent" of GOP priorities, including on DACA, in the compromise bill in order for the conference to coalesce around it.